The 24.18-carat "Cullinan Dream," the largest fancy intense blue diamond ever to be offered at auction, could fetch upwards of $29 million at Christie's New York on June 9. Barely a week ago, the 14.62-carat "Oppenheimer Blue" set a new world record for any jewel sold at auction when it yielded $57.5 million at Christie's Geneva. Even though the Cullinan Dream is nearly 10 carats larger than the Oppenheimer Blue, its likely selling price will be about half. This is because the Cullinan Dream's fancy intense blue color, VS2 clarity and Type IIb purity rating lies a tier below the Oppenheimer Blue's fancy vivid blue color, VVS1 clarity and Type IIa purity rating. Still, the Cullinan Dream is a very special diamond. Billed as the top lot of Christie's Magnificent Jewels auction at Rockefeller Plaza, the Cullinan Dream is the largest of four polished diamonds cut from a 122.52-carat rough stone discovered by Petra Diamonds at its famed Cullinan Mine in South Africa back in June of 2014. Petra reportedly sold the rough diamond for an incredible $23.5 million. A master gem cutter meticulously analyzed the rough gem to determine the best yield. He eventually produced four notably sized blue diamonds: a cushion-cut gem of 7.00 carats, a radiant-cut gem of 10.30 carats, a pear-shaped gem of 11.30 carats, and finally, the Cullinan Dream, a cut-cornered rectangular mixed-cut gem of 24.18 carats. Christie's set the pre-sale estimate at $23 million to $29 million. Set as a ring, the June 9 headliner, Lot 261, is flanked by tapered baguettes in a platinum mounting inscribed "Cullinan Dream." The baguettes have a total weight of 2.36 carats. Discovered in 1902, the Cullinan Mine is famous for being the source of many of the world's most famous diamonds, including a 3,106.75-carat Cullinan diamond that produced the 530.20-carat pear-shaped Cullinan I (also known as the Star of Africa), the largest polished white diamond in existence. The Cullinan I is housed in the Tower of London as part of the Crown Jewels of England. The mine's production statistics are extraordinary: 750 stones weighing more than 100 carats, 130 stones weighing more than 200 carats, and more than a quarter of all diamonds in existence weighing more than 400 carats. The mine is also a leading source for exceptional pink and blue diamonds. 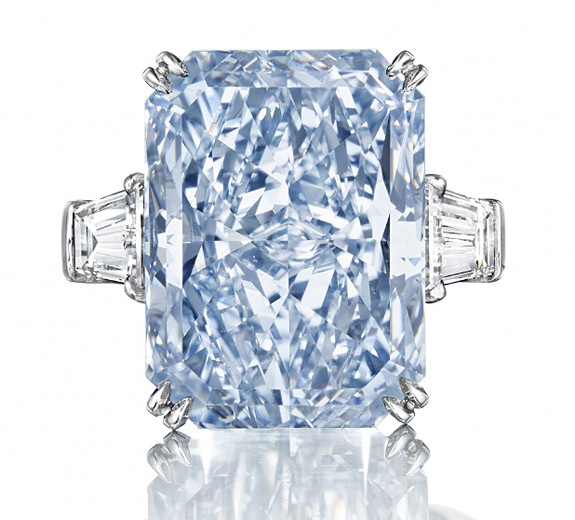 The Cullinan Dream owes its blue color to traces of boron in the diamond's chemical structure. Credit: Image courtesy of Christie's.